in Gauge is not crucial; you can use ANY yarn! 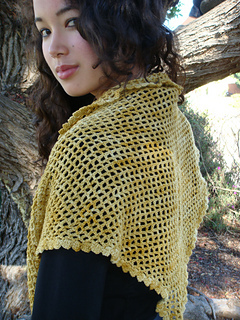 The photographed shawl is approximately 52" wide and 20" long, including edging, after blocking.However, the pattern is infinitely adaptable and can be made to any finished size. 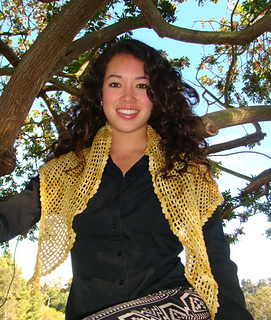 Made from the bottom up, Thalassa is a triangular shawl crocheted in an open mesh pattern. 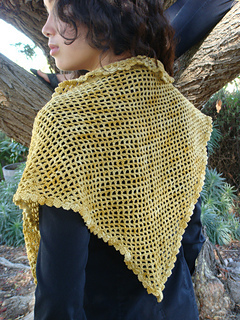 You can use any yarn (at any gauge!) for this quick-and-easy-to-stitch project. Its finished size is easy to customize, too: Just keep repeating the simple one-row pattern until you reach your desired size! Easy peasy.